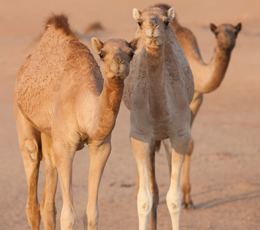 Camel grazing is recognized as a primary cause of ecological degradation in the UAE. A study of the perennial plant species <1m in height was conducted along a fence separating continuously camel grazed land from land in which camels had been replaced by oryx and gazelle species for 5 years (Al Maha). Vegetation regeneration in Al Maha in the absence of camels was considerable on all substrates (gravel, stable sand and semi-stable sand) but was greatest on the gravel substratum, indicating that ecology in this habitat is most at risk. Observed regeneration was primarily through vegetative reproduction and growth of existing plants, showing that existing species can tolerate heavy grazing. Therefore, an equilibrium grazing model of continuous and reversible vegetation dynamics is the most suitable for management of this ecological zone. Species richness was greater in Al Maha due to the greater number of plants, but biodiversity was unaffected. Ther was some evidence of localized dune stabilization within Al Maha due to increased vegetative cover. Further recovery of vegetation within Al Maha is discussed. This study highlights the need for reduced grazing pressure throughout the Dubai inland desert, and in particular gravel substrata.